In the relationship between organized crime and politics, politicians protect criminals from prosecution, and criminals, in return, either pay protection money or round up votes (or both). This system is derived from the fact that consumers’ willingness-to-pay for prohibited goods, such as prostitution, gambling, and narcotics, is higher than the cost of providing these goods (up to some level of production), generating a surplus equal to the difference. If these goods were legal, economic theory implies that prices would be set so as to divide the surplus between buyers and sellers, with the division depending on how sensitive to price increases buyers are. Making a good illegal (similar to the case of a sales tax) allows politicians to gain a cut of the surplus (in general, a sales tax is more efficient, but prohibition gives politicians more power to favor certain sellers over others), which they may extract either as direct cash payments (see, e.g., here), or through in-kind payment of get-out-the-vote activities. Sellers of illegal goods generally need to be tough characters, since they operate outside the protection of the ordinary law enforcement system that provides security for sellers of legal goods, and their toughness also makes them especially good at “convincing” voters to cast their ballots for a favored candidate. One major factor limiting the ability of politicians to capture the surplus from markets in illegal goods is competition from other politicians. The candidate who offers organized criminals protection from prosecution in exchange for the smallest share of the surplus receives their support. In 1924, Chicago Republicans were reeling. The GOP’s mayoral standard-bearer, William Hale Thompson, was so unpopular he had chosen not to run in the previous year’s election, making way for the victory of Democrat William Dever. Dever had run on a strong anti-crime platform, and he consistently attacked the syndicates that provided illicit alcohol and other illegal goods in the city. But while Chicagoans disliked crime, most of them were deeply opposed to alcohol prohibition, and their desire for liquor created an enormous surplus in that market. Republicans saw an opportunity to undercut their political opponents by offering the underground titans of beer a better deal. So when word got out that O’Banion was thinking about throwing his weight behind the Republicans in the 1924 election, Democrats convened a pow-wow between criminals and politicians in an attempt to stop the defection. 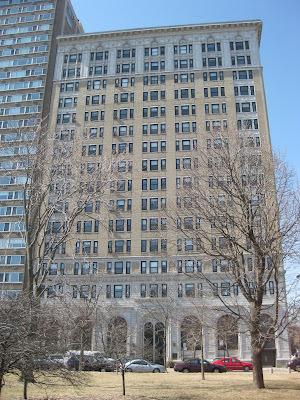 In early November, just a few days before the election, a banquet in O’Banion’s honor was held here, at the Webster Hotel (pictured above), 2150 N. Lincoln Park West. Besides O’Banion, representing the Northside gang were “Schemer” Drucci, “Bugs” Moran, and “Hymie” Weiss, along with a coterie of other associates, including Jerry O’Connor, vice president of the janitor’s union. Important politicians, including Democratic candidate for the U.S. Senate, Albert Sprague and county Clerk Robert Sweitzer, were present, as was a contingent of police officers, led by Chief of Detectives Michael Hughes. As a token of their appreciation, O’Banion was presented with a beautiful jewel-encrusted platinum wristwatch. The presence of Hughes was especially interesting. A crack detective, Hughes had come to Chicago at age 17 in 1888 from Ireland, originally finding work in the stockyards. By 1896, Hughes had joined the police force as a “probationary” officer, called in for work if a regular officer was unavailable. Hughes was a success as a police officer, and found himself at the notoriously corrupt 22nd street station during the 1900s, when it served as the means of exchange between the Kenna-Coughlin aldermanic regime and the pimps, madams, gamblers, and saloon-keepers of the segregated Levee vice district. It was there that he first learned how the political/criminal axis turned. Nevertheless, Hughes was apparently an excellent cop, and made detective in 1918, winning an award in 1920 for being the city’s top crime-fighter in 1920. He played a prominent role in all of the most cases, including the Leopold-Loeb murder and the assassination of “Mossy” Enright. In 1921, Hughes was named Chief of Detectives. The platinum watch was apparently not enough to sway O’Banion, and the 42nd and 43rd voted strongly Republican in 1924. Sprague lost to GOP senatorial candidate Charles S. Deneen, and the Republicans continued their gains until 1927, when William Hale Thompson regained the mayoralty (with strong financial support from Al Capone). Just days after the 1924 election, O’Banion was assassinated at his State St. flower shop headquarters, and his followers, Drucci, Weiss, and Moran, proclaimed a vengeful blood-letting. I don’t know anything about any banquet for O’Banion. I left the bureau that night, and at the corner I met Col. A. A. Sprague, commissioner of public works, who was then a candidate for United States senator, and County Clerk Robert M. Sweitzer. They asked me to accompany them to a banquet given for Jerry O’Connor, a union business agent, whom I know to be honest and clean. The banquet was for O’Connor, not O’Banion. I went with Sweitzer and Sprague, both close friends of the Mayor. This banquet was like almost all others; the hoodlums were there. They go to all such affairs. O’Connor was affiliated with the Sprague campaign committee and it was a sort of political gathering I left soon after I saw who were there, but there were many judges who stayed. The police department is rotten; I wouldn’t stay on under the present administration, if I had to take a job shoveling the streets. They have been wanting to get rid of me ever since Dever became mayor, but until now they didn’t have the nerve. Days later, Hughes’ friends convinced him to reconsider, and he was allowed to withdraw his resignation and went to work at the Irving Park station. Hughes was apparently exceptionally talented at policing, and by 1927, he was appointed head of the highway police department, which focused on the increasing vice trade in the suburbs. After Republican William Hale Thompson returned to the mayoralty that year, he brought Hughes back to Chicago, elevating him to Chief of Police (later retitled police commissioner). Hughes did battle with Al Capone during the late 1920s, getting under the Southside racketeer’s skin by not allowing him into the city to visit his wife and son at the family home. Eventually, however, the rising wave of crime forced Thompson to take action, and he asked Hughes to submit his resignation in August, 1928. Michael Hughes remained on the police force until his retirement at age 64 in 1935. Hughes passed on in 1954. Follow our signals today and make up to 270% per day.